Few announcements summon as much attention as a brand new iPhone, and this year, for the second time in as many years, Apple gave us two models of its smartphone to pore over. I got my mitts on the newest mobile devices in the hands-on area after Tuesday’s event, and here are a few first impressions about the latest entries in Apple’s mobile-handset line. When you first glance at the new iPhones, it’s the 5.5-inch iPhone 6 Plus that draws the eye, because it is—at least at first glance—comically large. It's far, far bigger than any iPhone we’ve seen to date; it looks to me more like a small iPad mini than a large iPhone. The 5.5-inch Retina HD Display (as Apple has termed the new screen) is absolutely gorgeous, as you might expect, and looks almost painted on. Every app I launched looked beautiful; if there were any apps not yet recoded to take advantage of the iPhone’s larger sizes, they were not immediately apparent. 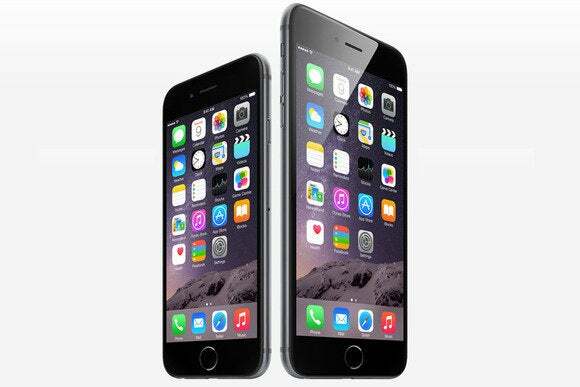 The two models are noticeably larger than the old iPhone 5s, the 6 Plus markedly so. Picking one up, the iPhone 6 Plus fills your hand: It’s not uncomfortable to hold, by any means, but folks with smaller grips may find it difficult to use one-handed. As with every iPhone I’ve ever handled, the build quality was excellent. The buttons and switches were firm and responsive, with a satisfying click from the Ring/Silent switch. With its curved aluminum edges and all-metal back, it actually brings to mind the original iPhone. Even the glass screen has a slight curve at the edges, which feels pleasant against your hand in a way that the sharp edges of the iPhone 4 and 5 (iPhone 5c excluded) series never quite did. In a big change, the Sleep/Wake button is now on the right side of the phone, making it easier to hit without adjusting your grip or resorting to a second hand. That leaves the top of the phone wholly unadorned with controls or ports of any kind. Picking up the iPhone 6’s 4.7-inch frame after handling the iPhone 6 Plus is like coming home, even though it’s noticeably larger than the current iPhone 5s. But it’s all about frame of reference. For example, when my 40-inch HDTV broke down last month, I originally considered a 42- or 46-inch model, but ended up ultimately going to a 55-inch screen. While it looked might have looked huge in comparison to my old 40-inch model, on its own, it certainly doesn’t feel too large. In other respects, the iPhone 6 is almost identical to the 6 Plus, right down to the placement of the buttons, ports, and so on. Outwardly, the only difference is their sizes—and in some ways, they’re not that different. Like Lucy pulling the football out from under Charlie Brown, every year we think the iPhone can't get any thinner—and every year we’re wrong. The iPhone 6 shaves off another 10 percent of the iPhone 5s’s obscenely thick 0.30 inches. (At a bloated 0.28 inches, the iPhone 6 Plus is ever so slightly thicker.) Certainly the increased height and length of both phones allows Apple to move around components in a way that allows them to reduce the thickness. The rear-facing camera on the iPhone 6 and 6 Plus protrudes slightly. There is, however, one casualty: the rear-facing iSight camera. Even with a quick glance at the iPhone 6 or 6 Plus, you’ll see that the camera lens protrudes slightly from the back. Is it noticeable? Certainly. I didn’t get a chance to put the new phones down on a hard, flat surface—Apple cleverly had them all resting on soft mats—but I imagine that it won’t sit evenly on its back. That's an un-Apple like move, but it’s not without precedent. (Remember the recessed headphone jack on the original iPhone?) But it does in some ways mar the iPhone’s otherwise sleek profile. Despite the slight difference in thickness and weight, I found the differences between the iPhone 6 and 6 Plus to be mostly unnoticeable; the latter is far more distinctive for its extra mass than its weight. Speaking of that extra mass, the iPhone 6 and 6 Plus does present some...challenges in one-handed use. Even someone with a moderately large hand will have trouble getting his or her thumb all the way to the top far corner of the display. When Apple first demoed iOS 8 back in June, it showed off some controls that were clearly harbingers of the larger displays to come, such as the tap-and-hold audio and video controls in Messages. These are easy to navigate with just a thumb—though, depending on whether you’re right- or left-handed, one may be harder to get to than the other. A double-tap on the Home button invokes Reachability. But Apple’s also added a new feature to address these problems on both the 6 and 6 Plus, dubbed Reachability. A double-tap on the Home button (note, not the double-click that brings up the multitasking interface) simply slides down the entire interface to about a third of the screen, letting you quickly access the interface without having to strain. The interface is fully functional—you can even tap the iPhone’s status bar to jump back to the top of a webpage, for example. A double-tap of the Home button returns everything to normal. Not unlike the camera bulge, this "fix" is weird and somewhat un-Apple. I found myself wondering if a better solution might emerge farther down the road. But I suspect that this feature will appeal to the same folks who frequently use the multitasking gestures that have been built into the iPad for a long time. It’s the iPhone’s equivalent of a keyboard shortcut; something for those power users who just don’t want to be slowed down. There are plenty of other interesting features that I didn’t get a chance to explore, such as the M8 coprocessor’s new features (sorry, no stairs to climb in the hands-on area), the new camera features, or its voice over Wi-Fi capabilities. But rest assured, when we get our own hands on the phones, we’ll be putting them fully through their paces.